We are delighted to announce we have won two awards this year! We have a large fleet of coaches for hire, offering the utmost flexibility for your travel plans. 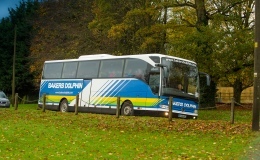 Established 1889, Bakers Dolphin is an award-winning Coach Operator based in the South West of England. It’s hardly surprising that after almost 130 years the company has become the experts in coaches and holiday travel, and now have one of the largest fleets around! From seven-seater mini-buses, right through to our double-deckers and top of the range Gold Coaches there’ll be a coach to suit your requirements. Whether you are looking to hire a coach for a day trip, a weekend break or for an extended duration, Bakers Dolphin are the top choice of many travel organisers in Bristol and the southwest of England. For a social occasion, a school educational trip, or a prestige business or VIP event, contact Bakers Dolphin – their highly experienced coach hire team will help you with planning itineraries and where appropriate their enormous buying power can save you £££’s on everything from hotels and ferry bookings, through to obtaining discounted tickets for theatres, concerts and sporting events. What’s more, Bakers Dolphin are delighted to announce that they have won two awards at the prestigious British Coach Tourism Awards 2018. These are for Coach Driver of the Year (Michael Blowers) and Coach Tour Operator of the Year, Large Fleet. at the Group Travel Awards 2017. The services we offer our Bristol and West Country customers are many, and all to a high standard so that you can relax and fully enjoy yourself. Our coach travel holidays include days out to stately homes and palaces, to flower shows and theme parks. Our days out and weekend breaks in London take you to the theatres, museums - or even for a posh ‘VIP’ afternoon tea in a five-star hotel! We’ve been helping customers have memorable UK and Continental holidays, days out, and trips to air shows and concerts by coach for over 90 years. Our ethos is to have our coaches and staff provide you with the best in high quality travel at competitive prices. To this day, we are still as passionate about giving you the perfect break as we were back in the 1920’s. It means a great service – tailored to you – with a hassle-free experience.